In our 3 week series to help you get a better nights sleep, so far we have discussed how to know when you need to replace your mattress and what to look for when buying a new mattress. But do you really know the types of mattresses available and what might work best for you? Or when the best time to buy a mattress is? Have you ever thought that your bed might be too high or too low for optimal comfort? The article below provides 5 mattress buying tips that you likely haven’t thought of when searching for a new mattress. A quality mattress is among the most important pieces of furniture in your home (if not the most important), but buying a mattress can be tough. Pushy salespeople, confusion over the different types, the financial investment—it all adds up to an overwhelming shopping experience. But, the fact remains: A good mattress is good for your spine. To make the purchasing process less daunting, this guide will provide some mattress basics to help you become a more informed consumer. Here’s a snapshot of the most common types of mattresses that may help support your spine. Innerspring mattresses are the most popular type of mattress in the United States. These mattresses are made up of padding and steel coils (from 300 individual coils to more than 1,000). These mattresses can be soft or firm depending on the type of coil and padding used. Salespeople may try to convince you that more coils means a better product, but it’s not as clear cut as that. Because innerspring mattresses have such wide appeal—and because many models fall within this category—your best bet is to test drive this mattress in store by lying on it for at least 5 minutes to see how it feels for you. Specialty foam mattresses use foam (either a single type or combination of foams) to contour your body and provide support. 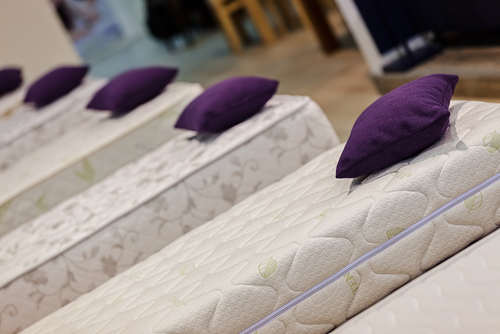 Foams used in mattresses include memory, latex, and polyurethane. As a material, foam is extremely flexible in terms of its ability to mold into different shapes and thickness, so it can adapt to the unique needs of a wide range of consumers. While grouped under the same category, foam mattresses vary greatly. For instance, memory foam is ideal for contouring and molding to your shape. Memory foam is great for people with chronic pain who struggle falling to sleep, but know that it can lock in heat. On the other hand, latex is better at providing firm support, so it’s a great choice if you have back pain. As many people with back pain understand, sometimes the pain “moves”—one day it might be in your shoulder, but tomorrow it could be in your low back. Adjustable beds (which include the mattress and base) are a fast-growing mattress type that offer a solution for people who experience a wide range of pain. As the name suggests, this type of bed allows you to adjust various parts of the bed (elevate, bend, raise, lower) so you can position yourself based on what’s most comfortable on a given day. Most types of adjustable beds also have dual functionality, so you can adjust your side of the bed in a different configuration than your partner’s. Like adjustable beds, air mattresses offer a custom level of support and allow each individual the ability to adjust firmness. This type of mattress should not be confused with the portable air bed you might take camping. Air mattresses feature an air chamber covered by cushioning, so it’s designed to look like a traditional bed. If you and your partner disagree on the level of firmness, this is a good option to keep the peace. Pillow-top mattresses include extra padding that covers the top of the mattress, which adds an additional layer of comfort and softness. Hybrid mattresses feature the steel coils used in innerspring mattresses with foam. Tip #1. Know that there’s no “perfect” type of mattress for back and neck pain: The best type of mattress is the one you find most comfortable. You may have heard that firm mattresses are best for back pain—and firm mattresses may certainly support your spine. But, if you choose a mattress that is too firm, it could come at the cost of your comfort. Look for a mattress that conforms to your spine’s natural curves and keeps your spine aligned when you lay down. Tip #2. The best time to buy: According to the National Sleep Foundation, new mattress models hit stores between May and September each year, so a Memorial Day sale is a top time to get a great deal. Tip #3. Don’t skimp on the box spring: The box spring absorbs the mattress’ stress and weight, and it’s a good idea to purchase the box spring designed to go with your mattress. Using no foundation, old foundations, or mixing mattresses and box springs can reduce your mattress’ level of support and durability. Tip #4. Think about your bed’s height: Mattresses come in varying thicknesses, so consider how a new mattress might change your bed height. You can determine if your bed is the right height by sitting on the edge of the bed. If your feet are flat on the floor and your knees are in line with your hips, your bed is the right height. If your feet don’t reach the floor, your bed it too high. If your knees are above your hips, your bed is too low. Tips #5. Know when to splurge on the extras: Mattress encasements, protectors, and pads will help extend the life of your mattress, and protect it from staining and dust mites. These items have varying levels of protection and price points, so it’s worth doing some research to determine which product meets your needs. You might also consider mattress toppers, which will give you an extra layer of comfort for a relatively small price tag. The warranty: If your mattress’ warranty has passed, you might consider purchasing a new mattress. The look: If your mattress is visibly worn (dipping in certain areas or springs are poking out), it’s time to buy a new one. The feel: Did you feel great when you initially bought your mattress, but lately feel achy and restless in the morning? It might mean your mattress is ready to be replaced. With so many mattress types, accessories, and price points, the purchase experience can be overwhelming. And, you may wonder if you are sleeping on the best mattress for you. Use this simple question to determine if you purchased the right product: How do you feel in the morning? If you wake refreshed, and your back and neck feel ready to take on the day, you are likely sleeping on the right mattress.